Transportation and communication around the world increasingly rely on lithium-ion batteries, with cell phones ubiquitous on six continents, and electric vehicles on pace to accelerate from a $1 billion worldwide market in 2009 to $14 billion by 2016, according to analysts Frost and Sullivan. NREL's Energy Storage group is working with the Energy Department, automotive battery developers, and car manufacturers to enhance the performance and durability of advanced lithium-ion batteries for a cleaner, more secure transportation future, said Energy Storage Group Manager Ahmad Pesaran. "The nanotube approach represents an exciting opportunity—improving the performance of rechargeable lithium-ion batteries while make them last longer," Pesaran said. "Increasing the life and performance of rechargeable batteries will drive down overall electric vehicle costs and make us less reliant on foreign sources of energy." Scientists at NREL have created crystalline nanotubes and nanorods to attack the major challenges inherent in lithium-ion batteries: they can get too hot, weigh too much, and are less than stellar at conducting electricity and rapidly charging and discharging. NREL's most recent contribution toward much-improved batteries are high-performance, binder-free, carbon-nanotube-based electrodes. The technology has quickly attracted interest from industry and is being licensed to NanoResearch, Inc., for volume production. Nanotechnology refers to the manipulation of matter on an atomic or molecular scale. How small? A nanometer is one-billionth of a meter; it would take 1,000 of the nanotubes in NREL's project lined up next to each other to cross the width of a human hair. Yet, scientists at NREL are able not only to create useful objects that small, but guide their formations into particular shapes. They've combined nanotubes and nanorods in such a way that they can aid battery charging while reducing swelling and shrinking that leads to electrodes with shortened lifetimes. "Think of a lithium-ion battery as a bird's nest," NREL Scientist Chunmei Ban said. "The NREL approach uses nanorods to improve what is going on inside, while ensuring that the nest remains durable and resilient." "We are changing the architecture, changing the chemistry somewhat," without changing the battery itself, she said. NREL's work was supported by the Energy Department's Vehicle Technology Office under the Battery for Advanced Transportation Technologies (BATT) program, which focuses on reducing the cost and improving the performance and durability of the lithium-ion batteries that power electric vehicles. 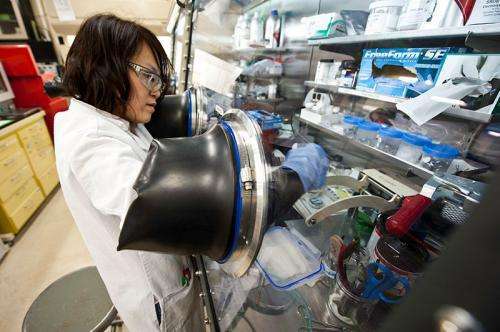 NREL Scientist Chunmei Ban spends a lot of time in the electrochemical storage lab for her work improving lithium-ion batteries through the use of nanomaterials. Typical lithium-ion batteries use separate materials for conducting electrons and binding active materials, but NREL's approach uses carbon nanotubes for both functions. "That improves our mass loading, which results in packing more energy into the same space, so better energy output for the battery," Ban said. "The NREL approach also helps with reversibility—the reversing of chemical reactions that allows the battery to be recharged with electric current during operation. If we can improve durability and reversibility, we definitely save money and reduce cost." Single-wall carbon nanotubes (SWCNTs) are expensive, but scientists and engineers working in the field are confident that as the use of SWCNT-based electrodes grows wider, their price will fall to a point where they make economic sense in batteries, Ban said. In a lithium-ion battery, lithium ions move back and forth in the graphite anode through an electrolyte; the ions are injected between the carbon layers of graphite, which is durable but unnecessarily dense. At the same time, electrons flow outside the battery through an electric load from the cathode to the anode. Electrolytes are essential in rechargeable batteries because they close the circuit inside the batteries by allowing ions to transfer; otherwise, the battery can't continue to conduct electricity from the positive to the negative poles and back again. High-energy materials, such as metal oxides and silicon anodes, have massive volume changes when lithium ions are injected and extracted from the electrode material. They swell and shrink, gather into a cluster and touch each other, shrinking in unison, causing collapse and subsequent cracks that can harm performance, leading to destruction of the electrode and thus lower lifetime. Certain metal oxides do a better job than graphite of teaming with the electrodes. But while they improve on the energy content and reversing functions, they still contribute to the large expansion in volume and the destruction of the internal structure. The NREL team turned to iron oxide, which is abundant, safe, inexpensive, and shows great promise. Yet, to be effective, the size of the iron oxide nanoparticles had to be just right—and had to be maintained in a strong matrix that was both flexible and resilient to deal with large volume changes while optimally conducting electricity. NREL tapped the unique properties of SWCNTs to address the challenges of heat, weight, and discharging all at once. "We use the carbon nanotube in this flexible network to make a conductive rope-like wrap," Ban said. So, when there is shrinkage, those wraps allow the electrons to reach the iron oxide and continue on the conductive path unabated. 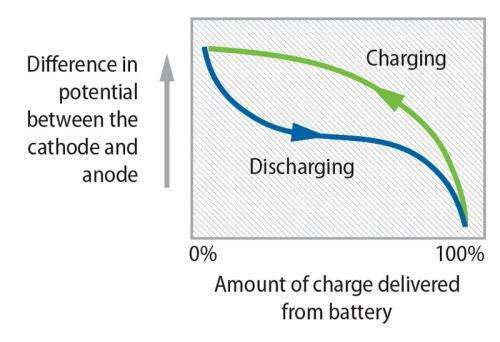 Using nanoparticles shortens diffusion length, enhancing the capability of fast charging and discharging. Using abundant inexpensive material means less need for such expensive metals as cobalt, currently used in lithium ion batteries' cathodes, lowering overall cost." The SWCNT with iron oxide solution produced a power density triple that of graphite, which means strong performance while eliminating much of the weight of a battery that depends on graphite. To get there, it was essential that the iron oxide particles be distributed uniformly within the encircling nanotubes. Ban and NREL colleague Zhuangchun Wu used hydrothermal synthesis and vacuum filtration to build lithium-ion anodes that don't require the typical binders (the adhesion strength that allows the battery to endure charge-discharge cycling) yet have high capacity. The first step was to make iron oxide nanorods as precursors for making electrodes. Ban and her colleagues discovered that at 450°C, annealing the iron hydroxide nanorods with SWCNTs would produce iron oxide. And, the SWCNTs contributed just 5% to the weight. Not only did the SWCNTs actually facilitate the formation of the iron oxide particles, but they ensured excellent physical and electrical contact between the two materials. For cathode electrodes, they embedded NMC—lithium nickel manganese cobalt oxide—in the nanotubes, causing the nanoparticles to become very conductive. The resulting nanocomposite retains 92% of its original capability to store and conduct electrical charges even after 500 cycles of charging and recharging. In a rechargeable battery, such as a lithium-ion battery, at maximum potential difference, the battery is fully charged and ready to provide power to a load. And when the potential difference is zero, the battery is fully spent and ready to be recharged. It's not as easy as simply putting nanomaterials into batteries, Ban said. "You need a special process to make it work." Ban and her NREL colleagues Wu and Anne Dillon used a vacuum filtration process to combine inexpensive iron oxide with carbon nanotubes. Ban brought her experience in wet-chemistry synthesis to the challenge of influencing the shapes of the nanomaterials to make them in the form of rods. "We know how to change the synthesis conditions to direct the design or realize the structure and shape of nanomaterials," Ban said. They chose a rod shape because they thought that would integrate well with the nanowires and curvatures of nanotubes, wrapping around them to create a robust electrode.The unusually long and very flexible strands of the nanomaterials are crucial to the superior features of the electrodes. They attach intimately to the particles, and their porosity allows for ideal diffusion. The innovative electrodes conceived by NREL can mean superior capacity, performance, and safety for lithium-ion batteries. David Addie Noye, who founded NanoResearch, Inc., with a plan to commercialize proven nanoscience innovations, visited NREL, saw the process, and decided to license the technology. The nanomaterial chemistry innovation and manufacturing process innovation that results in binderless electrodes "is a game changer because it helps solve a fundamental problem the lithium-ion battery industry has not been able to solve for decades," he said. The improvements in the lithium-ion batteries offered by NREL's approach also can make a difference in portable consumer electronics, such as laptops, tablets, cell phones, and portable media, as well as the stationary energy storage devices that will become increasingly important as more variable-generation renewable energy enters the grid. "We aren't making a new battery, but we're changing the architecture somewhat by using SWCT wrapped metal oxide anodes," Ban said. "By so doing, we improve the mass loading, energy output per weight, and volume." The process ensures a faster charge, and that's what is most essential to manufacturers and their customers. That means fewer trips to the recharging station, and a battery that keeps going and going and going.